Come rain or storm, some people will not let the weather dampen their spirits. 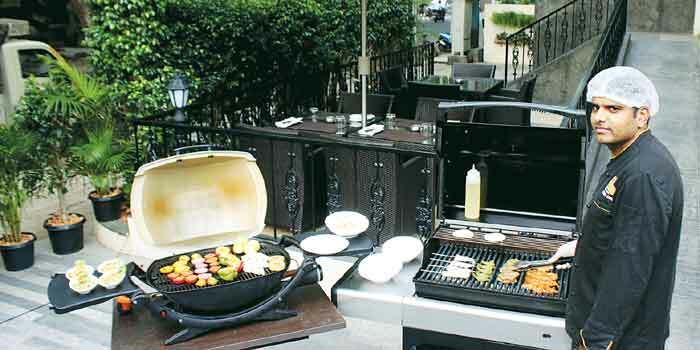 And so it was that despite the downpours this weekend, the team at the recently launched La��Amandier in RA Puram, dared to bring out their Weber barbecuer. What started as an outdoor weekend barbecue, was soon altered to be available indoors as well. 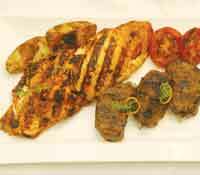 Thankfully, we manage to arrive just after the shower and are able to enjoy chef Prabhu Dhananjaya��s new barbecue menu at the restauranta��s al fresco section, with the meats grilling just a few feet away. The concept is straight forward. You get to choose from a list of vegetarian or non vegetarian barbecue platters for mains, that are paired with a set menu offering a soup, salad, sides and dessert. The soup of the day (roasted bell peppers, tomato and basil in our case) gets our appetite working and while we reluctantly prod at our sprouts salad, the potato wedges and sauces arrive. Therea��s a chilli and garlic mayo, tzatziki, a roasted tomato salsa and BBQ, that we start mixing and matching with our mains. The chef sends us to barbecue heaven with perfectly grilled prawns, rosemary-marinated beef medallions, chicken supreme, herbed eggplant, chilli and thyme-rubbed cottage cheese and even a special catch of the day a�� leather jack. The highlights? The fresh prawns with their delicately charred edges and you wona��t believe this one a�� the cottage cheese. Pliant on the outside, soft within, the slices leave a spicy after taste. We also like the chefa��s idea of offering warm, grilled fruits for dessert. Therea��s slices of pear or fig with a runny custard and my favourite, the grilled pineapple with ginger and cinnamon honey.